With Frozen Fever out in the cinemas and Frozen 2 announced I don’t think we’ll be seeing an end to little girls wanting Frozen themed birthday parties any time soon. An easy and unusual treat to put on the party table – these frozen ice and snow jelly shots mean you can have a jelly for every child without the mess. Using disposable shot glasses saves on washing up and looks really effective. All you need is a pale a pale coloured jelly – eg lemon, blue food colouring, blue sprinkles and marshmallows. If you prefer you can make an italian meringue (recipe below) instead of using marshmallows. You could also use a blackcurrant jelly to make a purple Anna version with pink sprinkles. Please note the gelatin means these are not suitable for vegetarians. 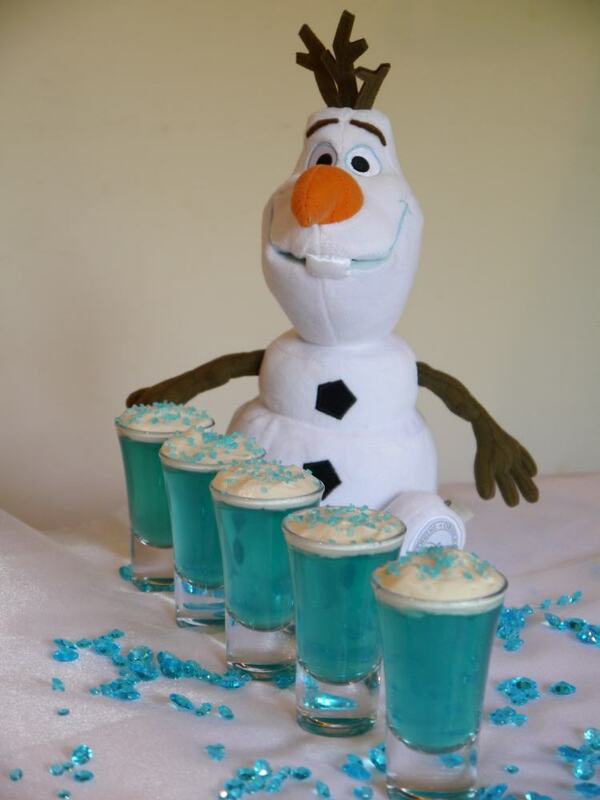 A fun and quick dessert for Frozen themed birthday parties. Pour into the disposable shot glasses leaving a gap at the top fr the "snow". Place the marshmallows in a bowl over a pan of boiling water and stir until they melt. Allow the melted marshmallows to cool then spoon the mixture on top of the set jellies and add sprinkles to decorate. In a small pan dissolve the castor sugar in the water. Once the sugar is dissolved do not stir the mixture. Use a stand mixer with a balloon whisk and metal or glass bowl to whisk the egg whites until they have doubled in volume and form stiff peaks. When ready to pour in the sugar syrup whisk at a high speed and continue until the bowl cools. While the egg whites are whisking heat the sugar syrup to 113.5c and then carefully pour the syrup down the side of the mixing bowl intothe eggwhites while whisking on a high speed. Continue to whisk until the bowl is cool to the touch. This cooks the egg whites and makes a beautiful marshmallow like meringue. Spoon the cold meringue on top of the set jellies and add sprinkles to decorate. If you are making the italian meringue you will need a sugar thermometer. Making the meringue may seem trickier but it is much easier to work with than the melted marshmallows because it can be spooned onto the jellies cold. The melted marshmallows reset as they cool meaning that they need spooning on whilst warm. This can melt the top of the jellies if the mixture is too warm.